Having launched Australia’s most travel agent friendly brochure last month, AAT Kings (www.aatkings.com) is continuing to make agents smile rewarding the top 15 sellers with a trip to Tasmania in March 2015. To help grow agents’ domestic bookings, AAT Kings is offering this great prize to those who book any AAT Kings guided holiday or Inspiring Journey from the 2015/16 Australia brochure with an Early Payment Discount before 9 February, 2015. 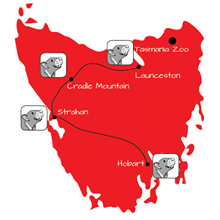 For every new guest booking, consultants will receive a ‘Tassie Devil’ icon and once they’ve collected four, they’ll go into the running to win a place on next year’s coveted famil of Tasmania which includes return economy airfares from all major cities and a visit to AAT Kings’ conservation project, Tasmania Zoo Devil Enclosure. To reinforce AAT Kings’ commitment to protecting Australia’s endangered Tassie Devil species, the travel specialist will also donate $2 per ‘Tassie Devil’ to Tasmania Zoo for any extra bookings agents make. AAT Kings has Australia covered with its 2015/16 Australia brochure featuring almost 60 guided holidays, short breaks and day tours as well as 16 new itineraries for clients to choose from. Helping make holidaying closer to home even more appealing to guests is AAT Kings’ 10% Early Payment Discount valid to those who book and pay in full before 28 November, 2014, or 5% on bookings made by 9 February, 2015. From coach to cruise and hiking to rail journeys, AAT Kings has a guided holiday to suit whatever budget or timeframe your client may have. For more information, visit www.aatkings.com, 1300 556 100 or speak to your sales manager. Connect with AAT Kings using #SmileKings and follow us on Twitter @AATKings, Facebook http://www.facebook.com/AATKingsAustralia and Instagram http://instagram.com/aatkings, and check out our videos on http://www.youtube.com/aatkings.